The 3¢ piece is an unusual denomination that is almost unknown to today’s collectors. The first 3¢ coin was made in 1851; it was first created to make it easier to buy a single 3¢ postage stamp (the cost of mailing a letter). As a result, the 3¢ piece is known as the “Postage Stamp” coin. Due to a shortage of silver at the end of the Civil War in 1865, the U.S. Mint started making the 3¢ coin in a copper-nickel alloy. The coin became known as a “Nickel,” although that name was later used for the 5¢ coin. When the letter rate dropped to 2¢ in 1883, this coin was no longer needed, and the last 3¢ coin was struck in 1889. All coins were struck at the U.S. Mint in Philadelphia. All Three Cent Nickels are over 120 years old and have been out of circulation since Benjamin Harrison was President and the Statue of Liberty was still a novelty after its dedication in 1886. This is the first and only 3¢ coin struck in nickel. The front of the 3¢ nickel coin shows a portrait of Lady Liberty; the back has the Roman numeral III (“3”) surrounded by a wreath. The coin was designed by James B. Longacre, the U.S. Mint’s chief engraver from 1844-1879. Longacre also designed the Indian Head Penny. 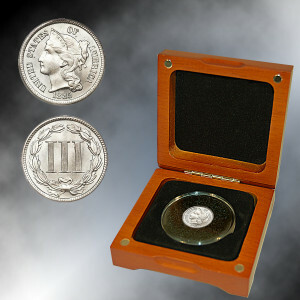 Your coin is encapsulated and comes in a handsome wooden display box. 3" x 3"